Yet we can still take steps to protect ourselves and our thyroids as much as possible, by controlling how we process those dubious holiday foods. I’m not saying that you should go off the deep end and destroy your diet. 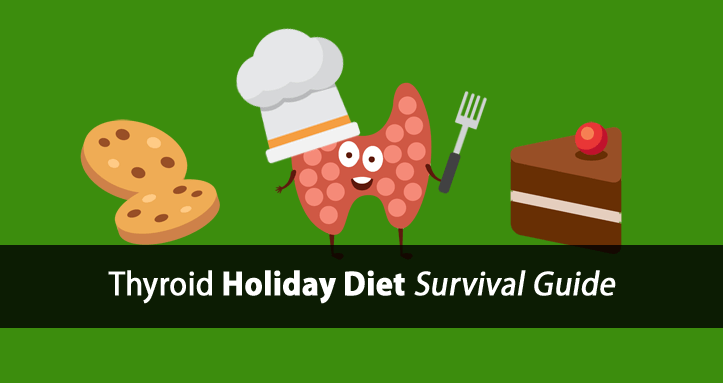 Instead, I want to give you a simple Thyroid Holiday Diet Survival Guide detailing 4 ways you can still indulge during the holidays without completely compromising your thyroid health. You probably already know that the right diet is fundamental to promoting thyroid health. Yet, did you know that there are ways to lessen the negative effects of certain thyroid-suppressive foods you might unknowingly encounter? For example, there is evidence that, when used correctly, certain supplements can help offset some of these negative effects and minimize the thyroid-suppressive effects. I’ll also tell you about a thyroid-boosting supplement that can protect your thyroid and also improve your mood by managing stress hormones that can be triggered by ingredients common in holiday foods. 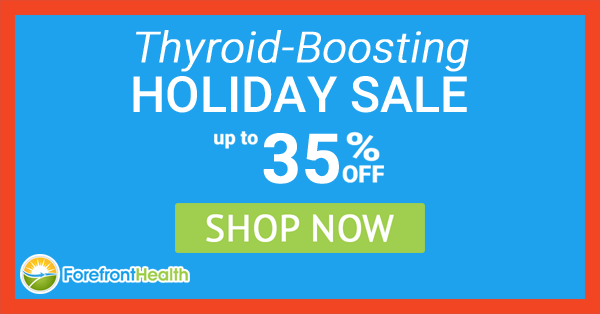 You can get all of the details about our Thyroid-Boosting Holiday Supplement Sale here. But first, I want to talk about a supplement that is important for regulating blood sugar and boosting metabolism. Want to enjoy more holiday sweets and treats, more energy, and with less guilt? Well, certain B-Vitamins can help due to their metabolism-boosting effects. Specifically, thiamine (Vitamin B1) is crucial for stimulating healthy oxidative (carbohydrate) metabolism and can help your body process more carbohydrates (sugars) that we often consume during the holidays while improving blood sugar handling. In other words, this means that thiamine helps turn carbohydrates (sugars) into energy instead of just elevating your blood sugar and/or storing those sugars as fat. As an added bonus, by stimulating healthy oxidative metabolism, thiamine also helps improve your ability to use thyroid hormone (T3) more efficiently. If you attend holiday parties or visit family and/or friends, you likely can’t control the quality or ingredients of the foods you eat. Most people cook with ingredients and fats that contain significant amounts of thyroid-suppressive polyunsaturated fats (PUFAs). Not only do these fats suppress your thyroid, but they also readily oxidize in your bloodstream, causing oxidative damage to your cells, tissues, and organs. Vitamin E is one of the most effective anti-oxidants that can help protect against the oxidative damage caused by PUFAs. While it’s pretty much impossible to avoid all PUFAs outside your home, it’s still best to protect you and your thyroid as much as possible. You can do this by using a high-quality pure Vitamin E supplement, such as our Forefront Health Thyro-Protect Vitamin E Complex. There are many well-known additional benefits to Vitamin E.
Perhaps the most popular use of Vitamin E is in lotions and skin treatments. Unless you’re celebrating Christmas in the tropics, your skin could probably benefit from the protection Vitamin E affords against the cold and dryness of winter as well. Even eating the wrong foods will increase your stress hormone levels. Yet, there are ways to help successfully manage it. For example, pregnenolone effectively increases dopamine and lowers stress hormone. The study above shows that allopregnenolone (synthesized from pregnenolone) decreases stress-activating ACTH (adrenocorticotrophic hormone) and the stress hormone cortisol by up to 60%. ACTH is the pituitary hormone that triggers the production and release of the stress hormones, including cortisol, by the adrenal glands. The overproduction of cortisol is well known to shut down thyroid hormone conversion in your liver while increasing production of reverse T3. That’s why it’s especially important that your body is able to regulate those stress hormones during the holiday season, when stress tends to run a little high. Another study published in the Journal of Neurochemistry found that pregnenolone also triggers the release of dopamine, which decreases stress hormone levels, and helps make us feel happy and relaxed. Who doesn’t want to feel happier and more relaxed during the holidays? One of the primary reasons we use our Pure Pregnenolone Powder is due to its strong anti-stress effects. Though Christmas foods are all delicious, changing your diet too quickly can sometimes make you feel a little… shall we say… uncomfortable. Plus, eating foods that are harmful to your thyroid health can cause inflammation and swelling of the digestive tract and lead to constipation. We all want to feel relaxed and happy during the holidays, and suffering from constipation is pretty much the exact opposite. Don’t worry though, because there is a safe and inexpensive supplement that can help. Cascara Sagrada keeps you regular by improving digestive function in two ways. First, it reduces intestinal edema, or swelling, which narrows the intestines and can cause constipation. Second, it increases energy of the cells within the digestive tract to improve digestive function. …we have something that can help. These supplements are safe, simple to use, and, most importantly, are effective tools you can use to take control of your thyroid health this holiday season. Even though the holidays can put extra stress on your thyroid health, it doesn’t mean that you can’t indulge a little or have to unnecessarily suffer. These supplements can help protect your thyroid from all those additional holiday thyroid pitfalls and help you make this the best holiday season ever.